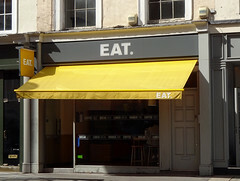 Takeaway sandwich/soup/pie/salad/coffee shop with a constantly-rotating menu, on the King's Road in Chelsea. Existence last checked by Kake, September 2018. Last edited 2018-09-10 06:24:23 (version 6; diff). List all versions. Page last edited 2018-09-10 06:24:23 (version 6).